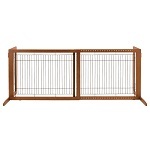 Richell Také Freestanding Pet Dog Gate Bamboo measures 24-inch high and covers between 40.4-70.5 inch opening perfect for just about and location in your home. 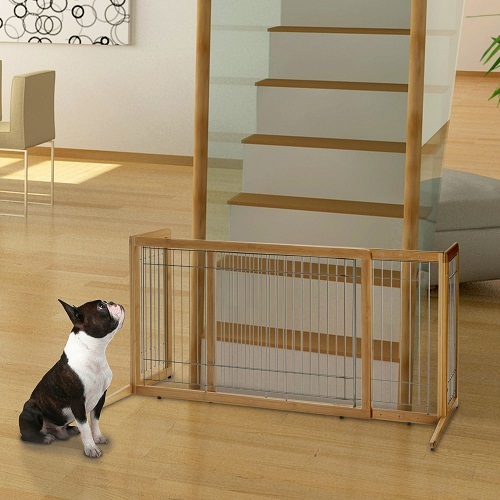 The supporting feet of the Richell Také Freestanding Pet Gate Bamboo span 20.1-inches to prevent the gate from tipping over while the rubber feet keep the pet dog gate from sliding and scratching surfaces. The Richell Také Freestanding Pet Dog Gate is lightweight making it easy for pet owners to move easily from one location to another. Wire is 7 Gauge or 0.144"